I spent the morning sanding down the foam stripped edges on the butterfly panels today. I covered the foam in aluminum duct tape to keep the polyester resin from dissolving it. I then had to run to Home Depot to get some brackets for Zac and Aaron, who were working on the lean-to. They got the rafters ready for the roof and carried the sheets of OSB up there. Tomorrow, they nail it down after everything is squared up. We wanted to wait until the end of the day to spray a layer of body filler on the butterfly panels, so I worked on the rear end a little bit to kill some time. I had gotten a little aggressive with the electric chainsaw a month or so ago when I was rough carving, so I made a dam, mixed up some urethane foam, and poured it on. This foam expands and hardens to create the volume I need to properly shape the tail. 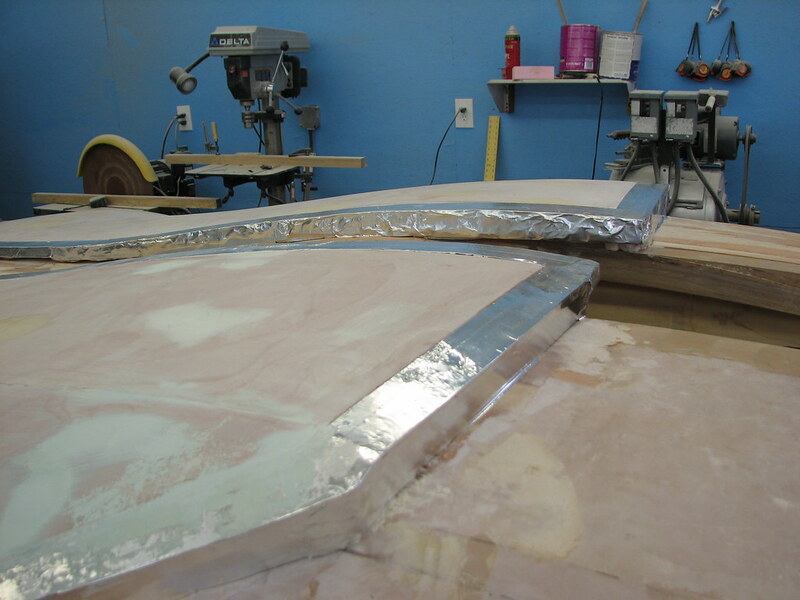 Tomorrow, I have some more fine work to do on the driver's side butterfly panel, after which we should be ready to start laying up our fiberglass molds. I am not particularly looking forward to that, but we have to do it. Story of my life. In other news, Howard Miller from Becker Acroma came by today, which was cool. It's always good to see our buddies.